Rosa Messina first appears in the Painesville, Ohio, area in 1916. In America, Rosa was known as Rose Messina, then after she married, Rose Caione. Rosa Messina, daughter of Tommaso Messina and Caterina Graziano, was born on July 20, 1912, at Palermo, Sicily. She married Pasquale Caione, son of Berardino Caione and Giovanna Calucci, on January 18, 1930 at St. Mary Catholic Church, Painesville, Lake County, Ohio. Rosa died on February 24, 1984, at Western Reserve Extended Care Nursing Home, Kirtland, Geauga County, Ohio, at age 71. Her body was interred at Riverside Cemetery at Painesville, Lake County, Ohio. Rosa Messina, age 4, immigrated to the United States on September 28, 1916, at New York City. Rosa, her mother, and siblings, Salvatore and Francesca, were traveling to 211 Storrs Street, Painesville, Ohio. They were joining her father, Tommaso Messina, in Painesville. 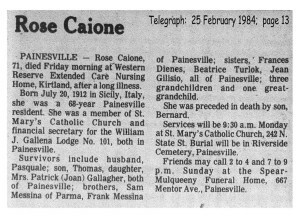 Rose Caione became a citizen of the United States on February 5, 1947. Rose resided at 365 Sanford Street, Painesville, Lake County, Ohio, when she was naturalized. 1. Bernard Caione was born about 1931. Bernard was killed on November 27, 1950. He was serving in the Army of the United States in Korea. 2. Thomas Caione was born about 1934. 3. Joan Caione was born about 1939. She married Patrick Gallagher.